The last leg of 2018 was a hefty one. Here be the goods. I am writing the soundtrack for the new game from Choice Provisions (creators of the BIT.TRIP series) and Accolade, Bubsy: Paws on Fire. INSANE! I’m exited to share more about the intricacies of this OST - involving layers and segments that work together in interesting ways. It’s super funky and fun, and it has given me the opportunity to lend my riff-writing experience to different genres and instrumentation. I’m stoked to share more. Also, it’s Bubsy what the heck for real? And the BIT.TRIP guys are doing it? Well then. You can watch the trailer for some gameplay and a little taste of the music. Last year at MAGFest, a crew of musicians banded together to form the Retro-Active Live Experience. We played the original music of Ninja Gaiden composer, Keiji Yamagishi, as a headlining act on behalf of Brave Wave. It went really well! After some planning and deliberation, we have now reformed as the official house band of the Brave Wave label. We are called Super Strikers - a five piece live outfit that will support the roster of Brave Wave artists, including the likes of Manami Matsumae (Mega Man), Masashi Kageyama (Gimmick! ), and Harumi Fujita (Bionic Commando). We have recorded two songs so far, and plans are brewing for further into 2019. Outside of the band plans, it is an honor to be playing in a band with Dino and Kev (Chromelodeon, Cheap Dinosaurs) and ap0c. Those guys slay. More info soon on the future of Super Strikers! The talented Seajeff just released a new album called Changes. I have a remix of the title track at the end of the album. It’s a banger. I am currently working on the mix of our full MAGFest performance, and Sam is cutting together video. More on that soon. 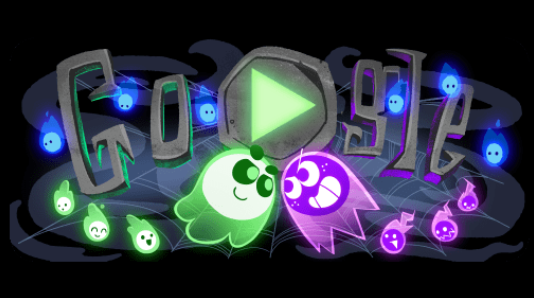 I contributed to my second Google Doodle - this time a multiplayer video game! The game music was created by Aivi and Surasshu of Steven Universe fame, and I added guitar. Ikenfell is an RPG slated to come out later this year. I have offered guitar to a number of guitar contributions to the soundtrack, and recently, Aivi Tran posted a sample of the themesong. You can hear it on Twitter. Materia Collective recently put out an album of menu music arrangements from a variety of games - pretty cool idea! I contributed guitar to Michael Hoffmann’s arrangement from FTL. It’s super snazzy. You can hear it on Bandcamp. WeaponEx has released their long-awaited follow-up, In The Nick of Time. I’m a huge fan, so to mix and master their new album was a big joy. I got to make it sound like I wanted. They are one of my favorite indie prog bands, and this guitar playing and hook writing needs to be heard. Ronin Op F is a Bay Area artist that does video game arrangements and plays violin for a number of artists in and out of the area. His style is decidedly 90’s which pleases the heck out of me. I mixed and mastered his latest EP, which contains arrangements from “The World Ends With You”. It feels good to have musical doings to share. However, there is a lack of original music in this post! I have about 70 minutes of unreleased original music that should be coming out in the not too distant future. I guess that’s what happens when you are making music for projects and not just for yourself. Other stuff is in process as well. I’m exploring live Stemage shows (I don’t mean, Metroid Metal, something new), Yes Mayhem is on the move, and other new game music projects are on the calendar. I also need to get some of these new riffs down. If anyone figures out how to stop time, let me know. P.S. Please check out my Twitter and Facebook for more frequent updates.